This is a little history about Memorial Day. 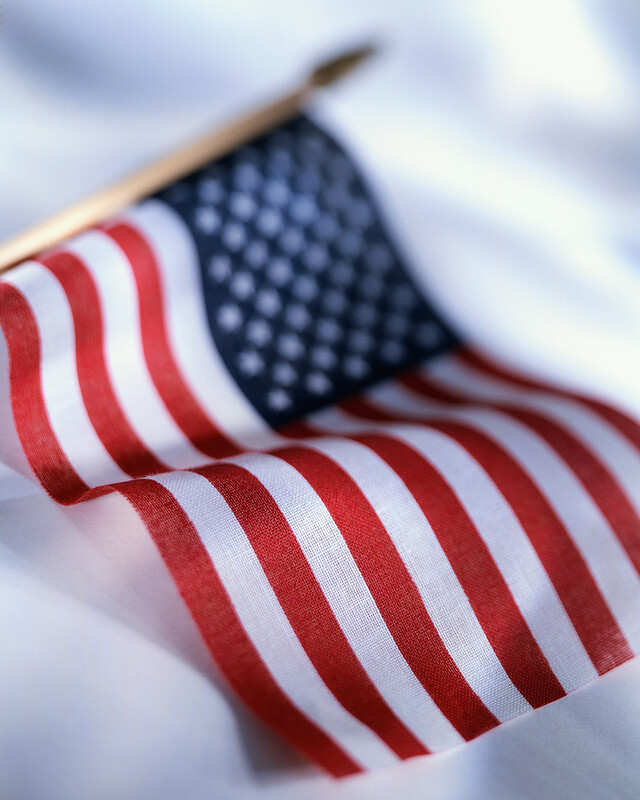 On Monday, Americans will be celebrating Memorial Day. Considered by many to be the opener to the summer season, the holiday actually has roots that stretch back through the nation’s history to the Civil War. That history, shared by the Department of Veterans Affairs, started when the head of an organization of union veterans, called the Grand Army of the Republic, established Decoration Day on May 5, 1868. The day was meant to be a time for citizens to decorate the graves of the war dead with flowers. Maj. Gen. John A. Logan declared that it should be observed on May 30, possibly about the right time so that flowers would be blooming all over the country. Congress declared Memorial Day to be a national holiday in 1971 that would be celebrated on the last Monday in May and would honor all soldiers who had died in the nation’s wars. In addition to that, the National Moment of Remembrance Act passed in 2000 suggests that people pause wherever they are at 3 PM local time on Memorial Day to remember those who have died in service. 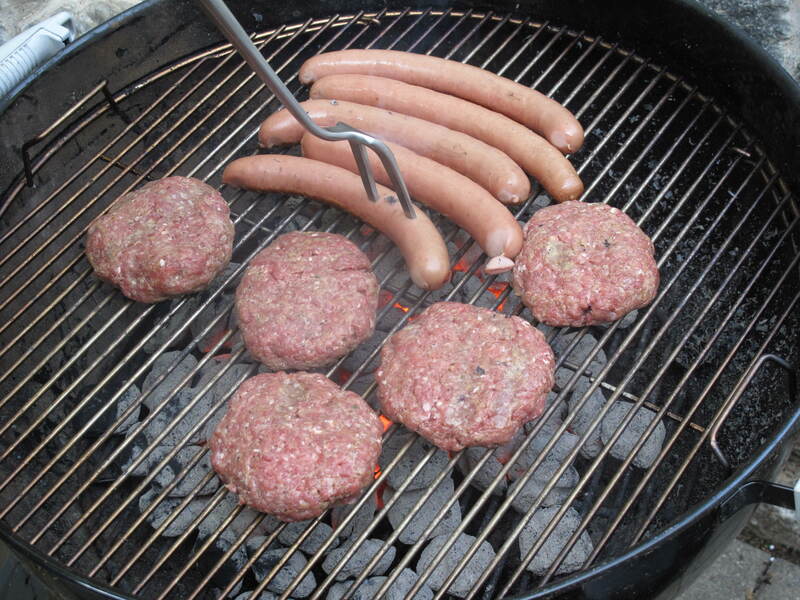 What will you be doing this Memorial Day weekend? This is a close up of our favorite flower here on Glen Road. 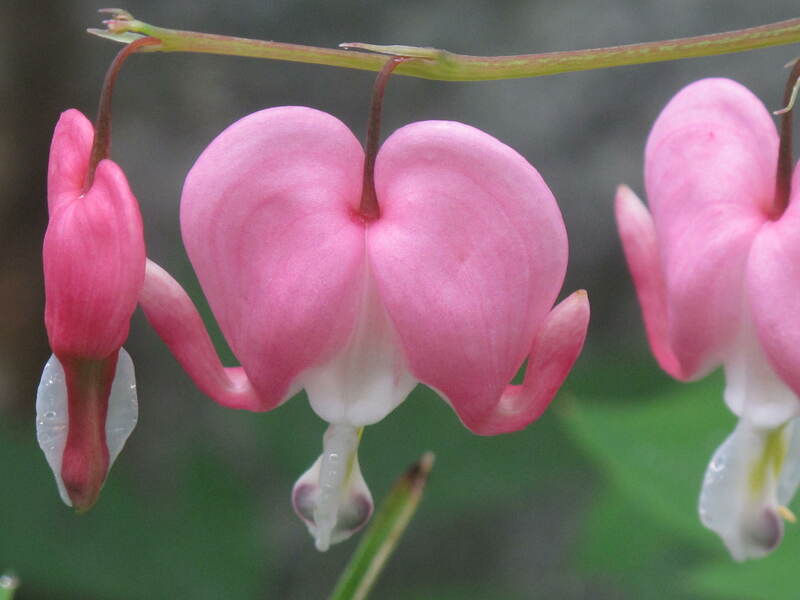 Dicentra spectabilis, otherwise known as bleeding hearts. What’s blooming in your garden? 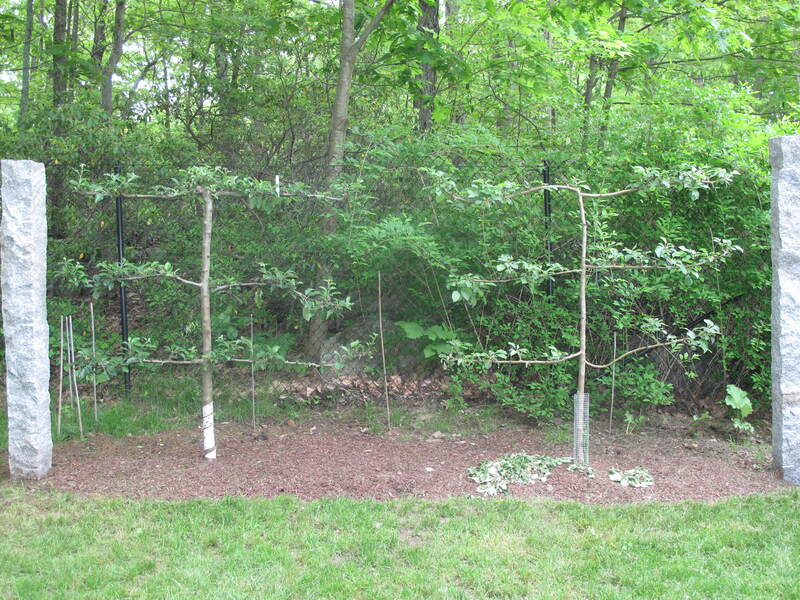 This is another story about our espalier apple grove…all two of our trees. Earlier this week, we wrote that we noticed that our Malus ‘Liberty’ was looking a little overgrown compared to its new cousin Malus ‘Gravenstein’. In other words, we noticed that ‘Liberty’ needed a little haircut. So a good pruning was in order. Our research had said that the espaliers should be pruned when dormant. However, since we are new to the pruning process, we decided to wait to see what was growing in a crazy manner and then cut it off. We just didn’t want to take a risk of cutting something out and realizing later that we had made a bad mistake. You can see the finished job in the picture above….haircut complete. When we started our pruning job, we paid close attention to ‘Gravenstein’, which was pruned already, and compared it to ‘Liberty’, which was not. 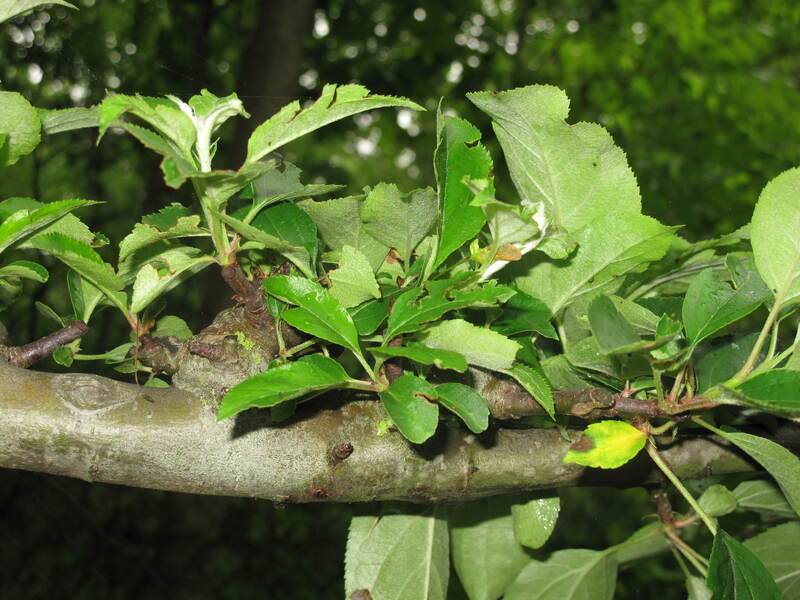 Notice in these pictures below that ‘Gravenstein’ has leaves that are close to the branch and spurs on the branch and there are no long vertical growths coming out. If you are asking what a spur is, the best way to describe it is a very short piece of branch where the apple tree flowers and sets fruit. Pruning encourages the tree to grow more of these fruiting spurs by removing competing suckers and unproductive wood. 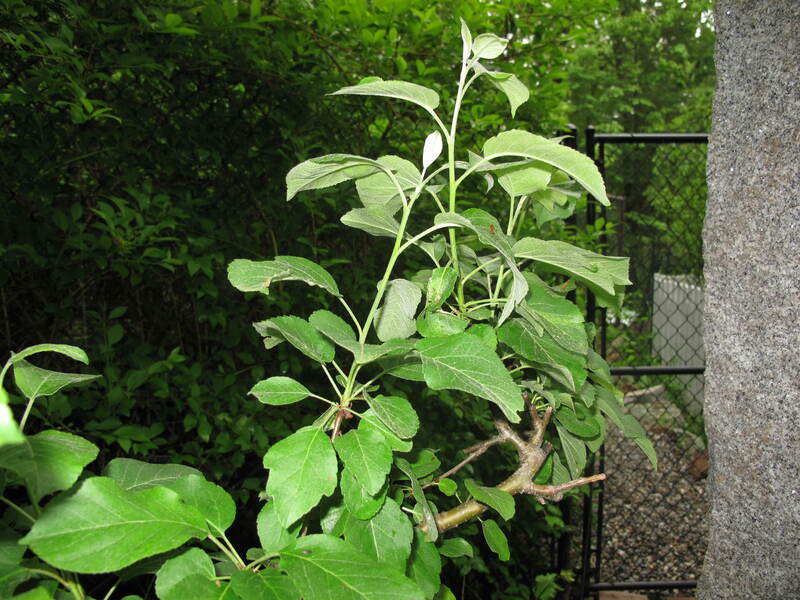 A sign of a well-trimmed espalier is the close-growing leaves without any vertical growth. ‘Gravenstein’ looked like this. However, ‘Liberty’ was not in such good shape. You can see it better in these pictures. See the growth coming out of the ‘Gravenstein’ spur and main branch? 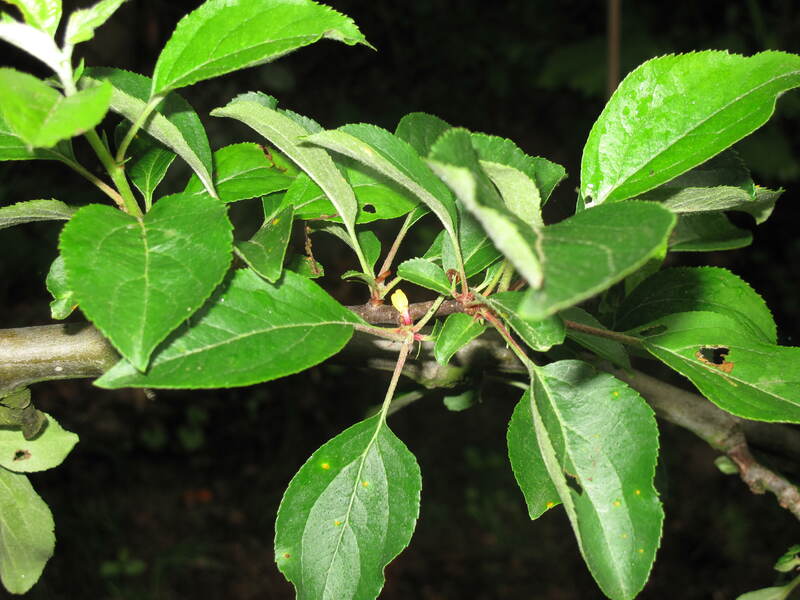 The leaves are close to the spur and branch and never more than about two inches long. Here’s crazy cousin ‘Liberty’. See the vertical growth coming out of the branch. We pruned all of these vertical baby branches out and only kept close growing leaves near the spurs and branches to promote fruit growing. Another close up of the foliage on ‘Gravenstein’. See how tight and close the leaves are? Another shot of ‘Liberty’. It doesn’t take much of an expert to see the long growth that needs to be cut off. Fortunately, none of the growth that needed to be cut off had any baby apples attached. After pruning all the vertical growth off of ‘Liberty’, both espaliers looked pretty much the same with some beautiful leaves growing not more than two inches off of the main branch or growing spurs. All it took was some patience, some pruning shears and a barber-like mentality. No blow dry was necessary. Are you in the process of pruning any trees in your yard? This is the progress in the vegetable garden this weekend. Not much went on, but with all the rain we have been experiencing, a little bit of work is a lot. 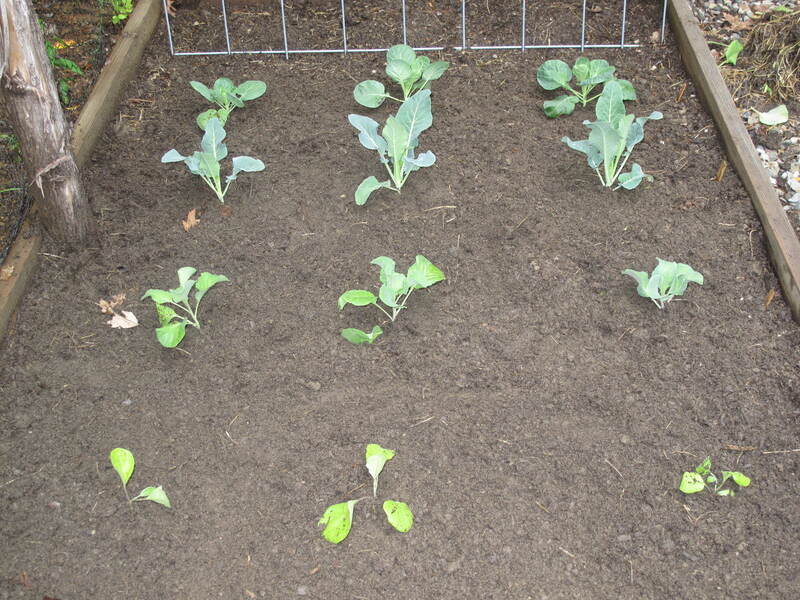 We had laid a tray of vegetable plants out last week that were grown under our grow light in the basement, but the rain stopped us from putting them in the ground. This was probably a good thing as it gave the young plants some time to get used to the weather outside and begin to adapt to the new environment. 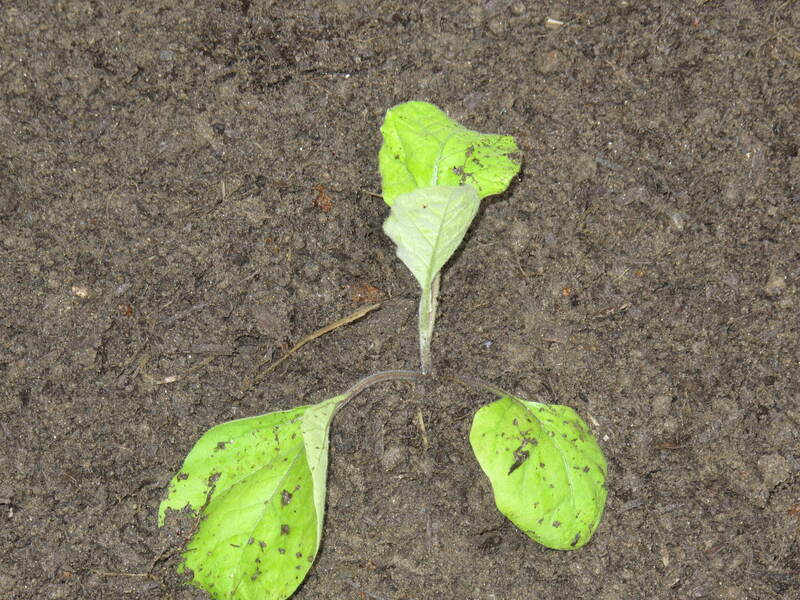 Little did the young plants know that they were acclimating to a monsoon-type environment given all the precipitation that occurred last week. Finally, there was a small break in the weather and we rushed out to put the plants into the soil. Here is a little taste of what went into the ground. 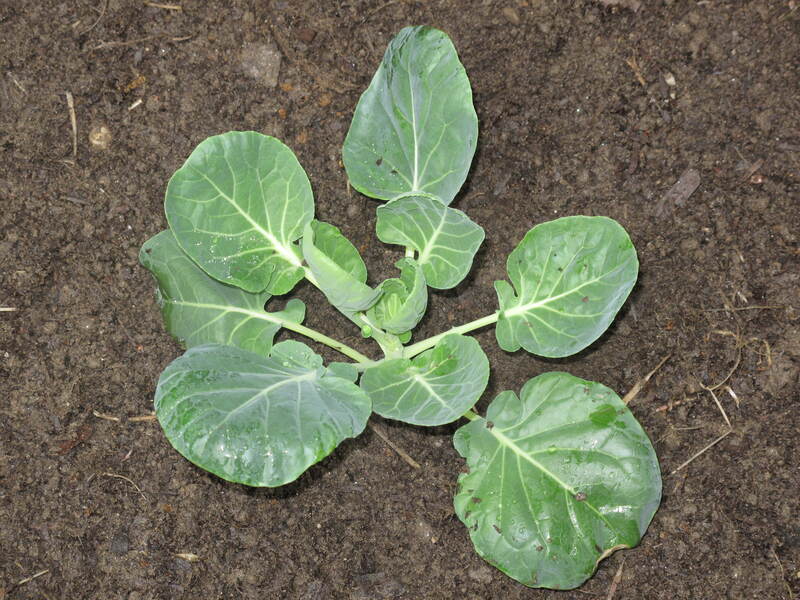 First, a little cabbage. We love cabbage and have a great soup recipe that is simple and delicious. Let’s not forget our cauliflower. Lots of cauliflower macaroni for our Brooklyn Italian Grandmother to cook. Are we the only ones that like brussels sprouts? 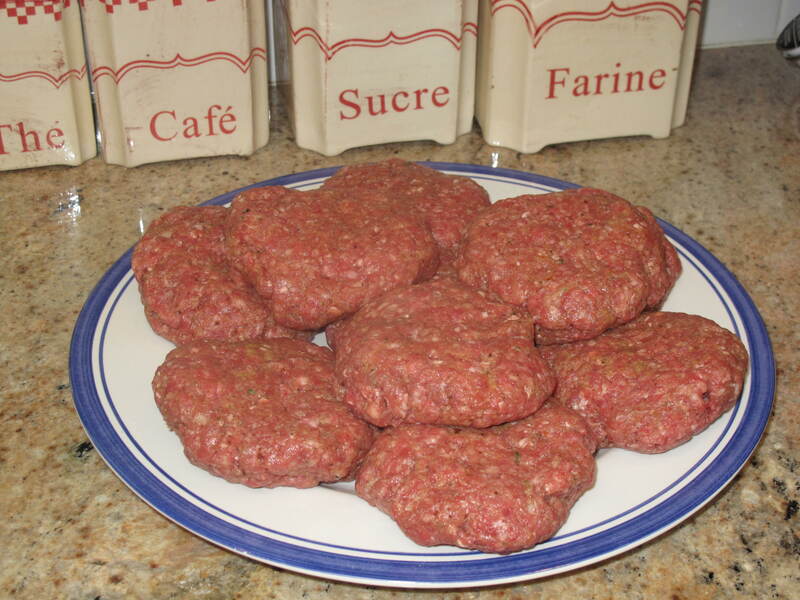 Boiled and then mixed with salt, pepper and butter. 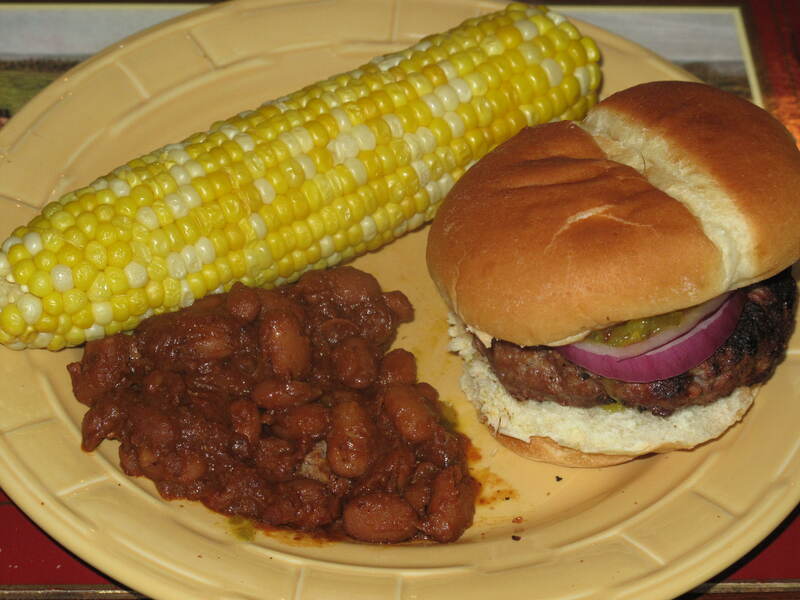 Simple heaven! Last, but not least, a spindly looking eggplant. Hope it makes it!! We have so many eggplant recipes it is crazy. The rest of the garden is doing well. 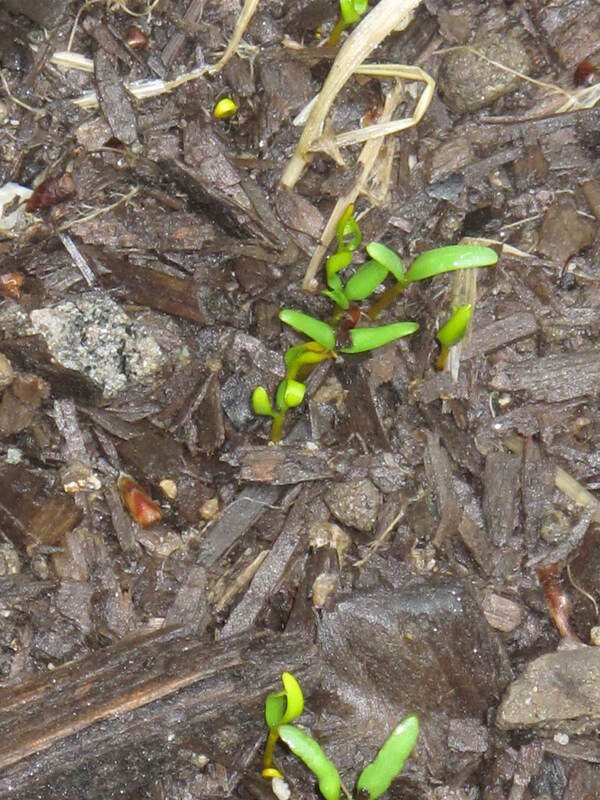 We couldn’t believe that some seeds that we planted last week were already sprouting. 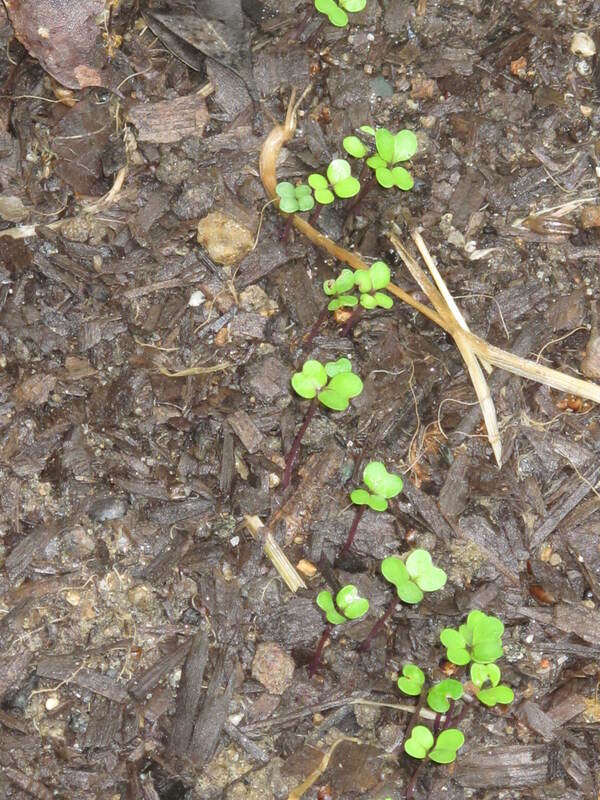 Here are the turnips peeking their heads out of the dirt. Here are some beets that shot up too. These are the golden variety. Does this mean they are tougher than their dark red cousins? Our lettuce is almost ready for some picking. 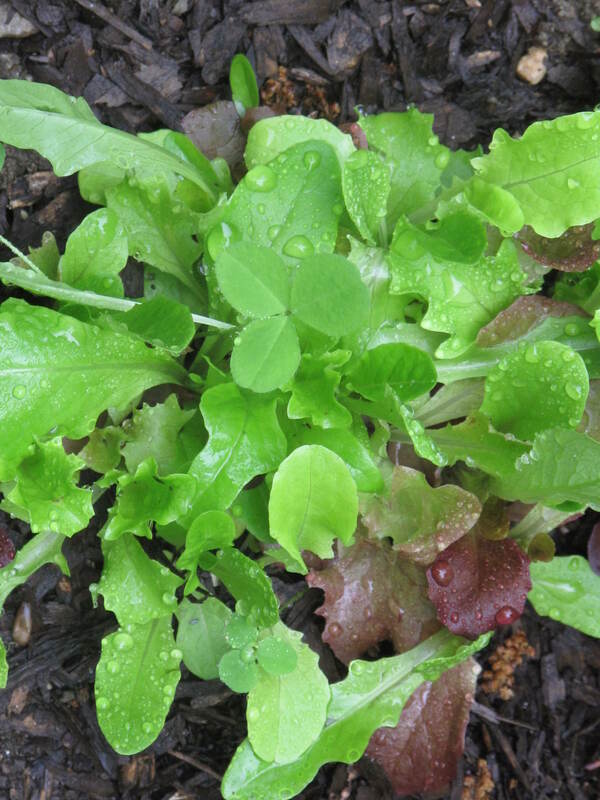 If we get a little hot weather, it should grow quickly and be in a salad bowl in no time. Doesn’t it look good with the raindrops stuck on the leaves? A little vinegar, some oil and a fork….that’s all we need when the lettuce is ready. So not a great week for gardening-flowers or vegetables, but we guess Spring is known for lots of wet weather, right? The only thing that really benefited from all this rain was our newly seeded front lawn. So there you have it…we’ve found at least one benefit from all this crazy weather. For all of you gardeners out there, isn’t it a great feeling to see all your hard work finally grow into something edible? To see our seeds sprout or our grow light plants get put into dirt is a very proud and satisfying feeling. It makes all the hard work seem worth it. How is your garden growing and did you have crazy weather that set you back a bit? This is the new support system for the espalier apple trees. 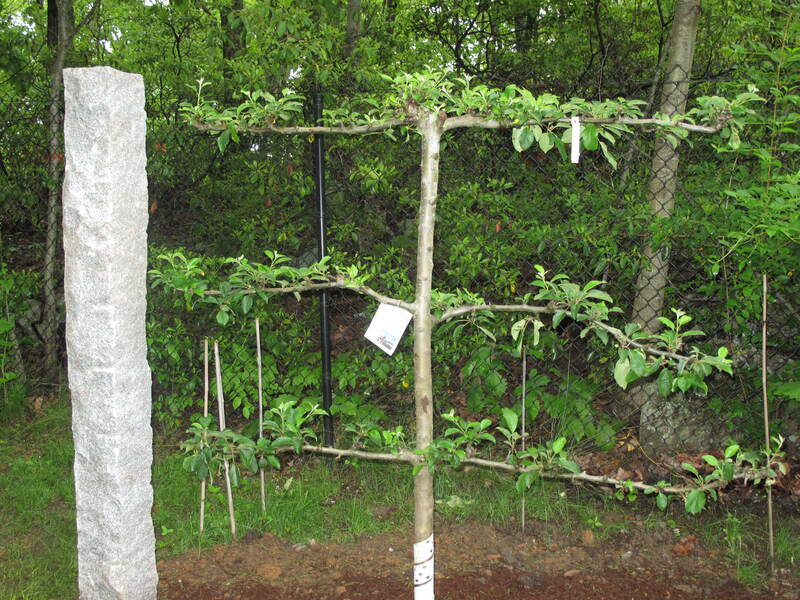 Remember the first time you met the espalier apple trees? A lot has happened since that time. First off, we noticed that one of the apple trees, Malus ‘Spartan’, did not fully come back this year from the hard winter we experienced. Although one side of the tree grew leaves, the other side had died. We then made the painful decision to take the tree out and replace it with a new one. However, when we went back to the nursery to buy a replacement, the nursery said the tree was guaranteed for a year and we received a free replacement. How cool!! So meet our new tree, Malus ‘Gravenstein’. Gravenstein is a variety of apple native to Gråsten in South Jutland, Denmark. 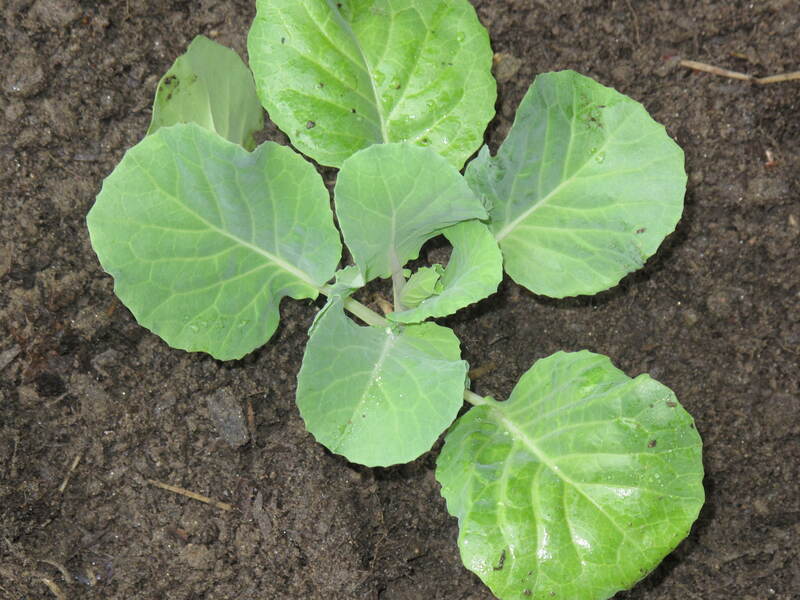 The variety was discovered in 1669 as a chance seedling, although there is some evidence that the variety originated in Italy and traveled north. The Gravenstein was introduced to western North America in the early 19th century, perhaps by Russian fur traders, who are said to have planted a tree at Fort Ross in 1811. The Gravenstein apple has a sweet, tart flavor. 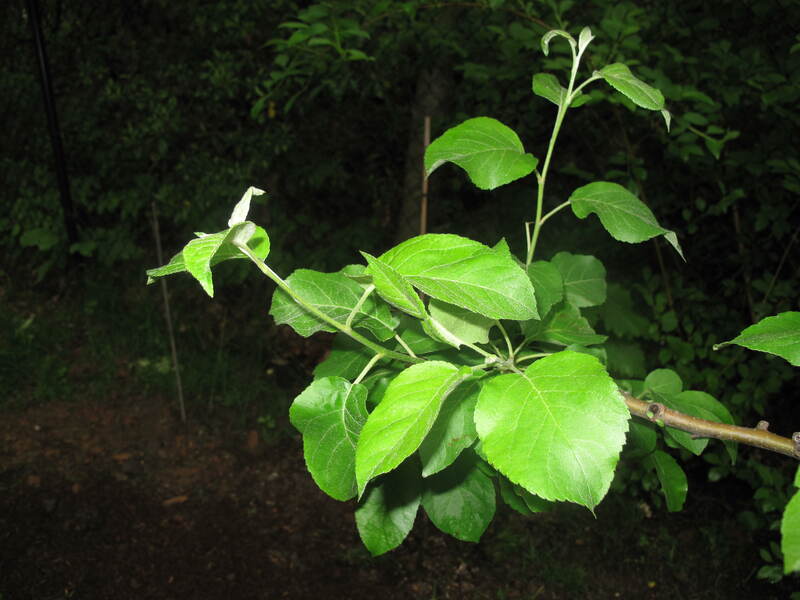 It is picked in July and August and is heavily used as a cooking apple, especially for apple sauce and apple cider. It does not keep well, so it is available only in season. 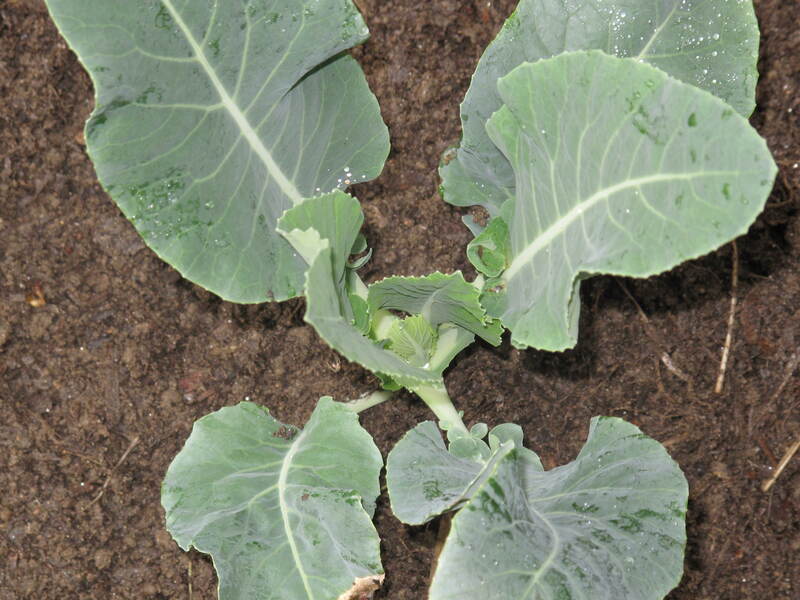 In addition, their short stems and variable ripening times make harvesting and selling difficult. The skin is a delicately waxy yellow-green with crimson spots and reddish lines, but the apple may also occur in a classically red variation. Our older tree, Malus ‘Liberty’, is proud to meet its younger cousin. The other change in the espalier apple tree grove is that we began to realize that Malus ‘Liberty’ had branches that were beginning to bend. If you look at the picture above, you will see the bottom limb is bent or crooked. 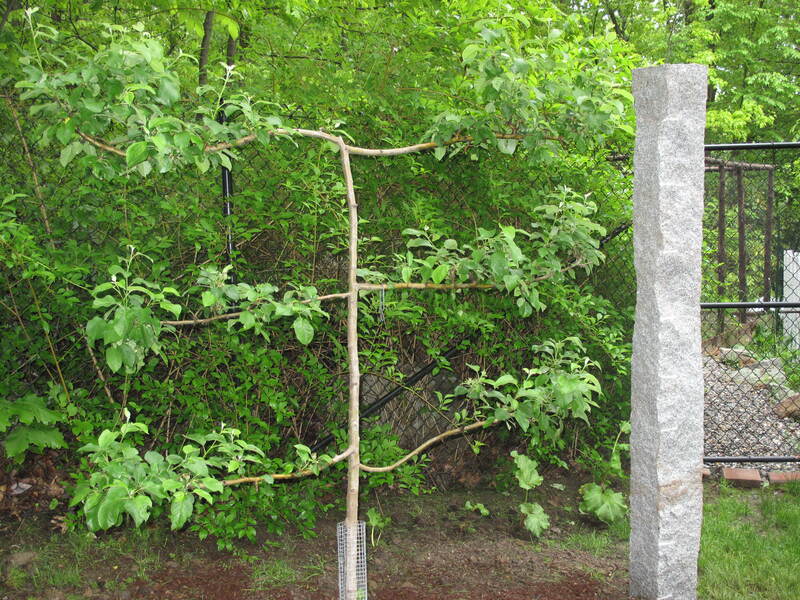 In order to fix this, we worked with a landscaper to embed two granite posts on either side of the trees. Although not completed yet, we will be running wire from one post to the other in three separate rows and tie each of the limbs to the wires for support. During the summer, we will tighten the ties that will move the limbs closer and closer to the wire and therefore making each limb straighter and straighter. 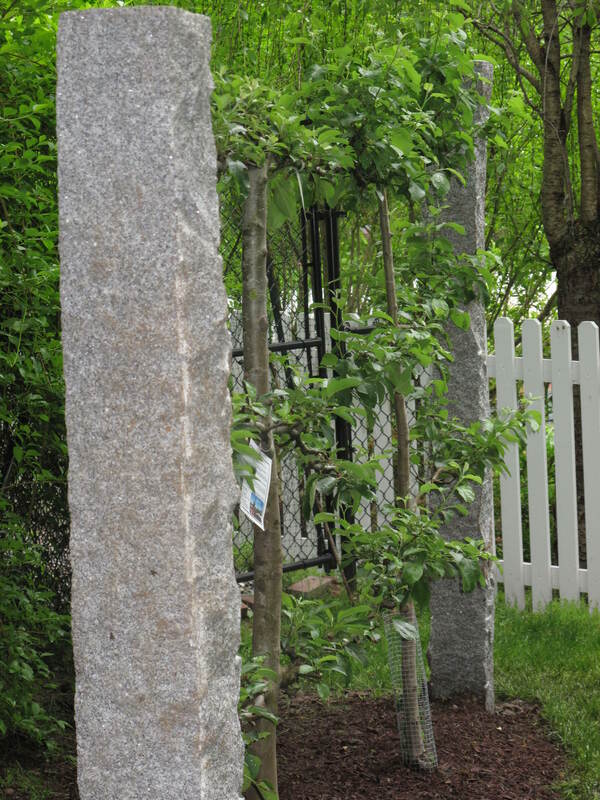 The granite posts also give the area quite an architectural look and feel. So a lot has been happening in the espalier apple tree grove….if you can call two trees a grove. We noticed that Malus ‘Liberty’ needed a little leaf trim so that will need to be done. After that, we will wait it out and hopefully get a few apples from the trees later in the Fall. Let’s keep our fingers crossed. 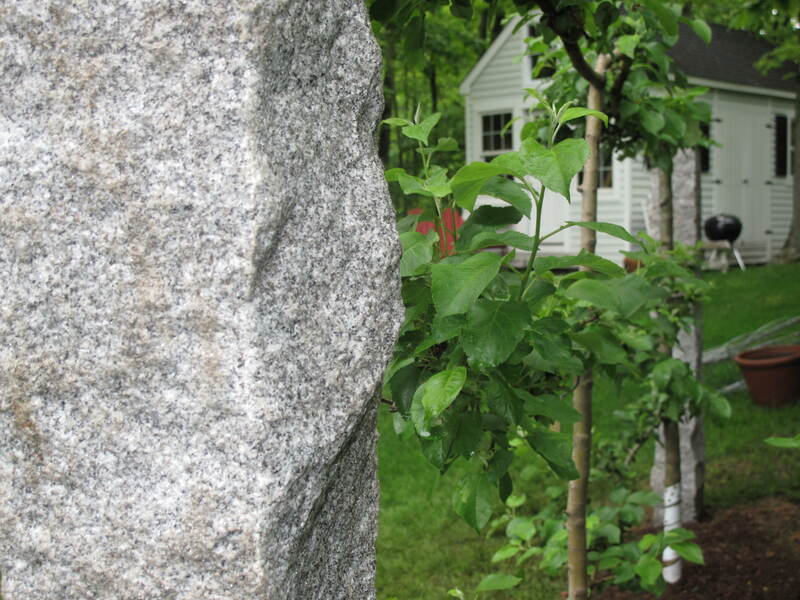 Do you have any fruit trees in your garden and how do you care for them?